West Midlands Police are one of the first forces in the country to fully embrace a new code of practice aimed at slamming the door in the face of thieves trying to sell stolen goods. A Home Office Code of Practice encourages forces to get second hand stores signed up to a scheme where they check all items offered up for sale against the CheckMEND database which logs if goods have been recorded as lost or stolen. The force have hundreds of stores such as Cash Converters, Cash Generator, Cex and other independent second hand stores signed up to the scheme and are launching it in style on 23 January with an Impact Activation Day. On the day officers across the force will be at second hand stores, schools and shopping centres registering goods onto the immobilise database for free. Each of the stores who have signed up check items offered for sale against the CheckMEND site. Each search generates a unique certificate number. This can be issued to a potential buyer to prove that at the time of purchase the item was not reported lost or stolen and no adverse information was recorded against it. Now we can use CheckMEND we can buy items from people who come in off the street. We have been dubious about doing that in the past because we have not been able to trace the history of the item. This has opened up new possibilities in how we can conduct our business that is of real benefit to us and our customers. Our officers have been passionate about getting stores signed up as one of the main ways we can stop the sale of stolen goods and ultimately deter burglars and thieves. The more the public register their goods on immobilise, the more effective the system will be. Residents in East Lancashire are being advised to take a few simple crime prevention measures to avoid being targeted by thieves. Officers are encouraging people to register their phones, gadgets and other expensive items on a property database, such as immobilise.com to deter thieves and increase the chances of getting any stolen items returned. Valuables left near windows can prove tempting for criminals and unlocked doors and windows make it easier for them to come in and steal your possessions. Keeping things out of sight and locking up when you go to bed or leave home can prevent your home being broken in to. However, if you are targeted by criminals, listing your new phones, gadgets and other presents, including bikes, on a property register database, such as immobilise.com can greatly increase the chances of getting the items returned to you. This is a free service and only takes a few minutes of your time. When we seize suspected stolen property we can use the database to try and reunite it with its original owner. Second hand shops can also use a sister site to check whether an item is stolen when it is offered to them. 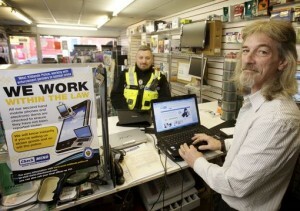 To view the source article and for more crime prevention advice visit www.lancashire.police.uk .